What makes this documentary, Diana Vreeland: The Eye Has to Travel, so entertaining is that the late Diana Vreeland is an extremely eccentric character and despite the fuzzy interview footage, pulled from the early 1980’s, you can’t help but become mesmerized by her voice and her overall excitement for life. The director, Lisa Immordino Vreeland, who is Diana’s grandaughter-in-law, uses photo images throughout the film that Vreeland produced as a Columnist for Harper’s Bazaar and later as Editor-in-Chief of Vogue, and they are so distinctly original, even by today’s air-brushed standards, that the viewer is left dazzled. Diana Vreeland wasn’t just a magazine editor but a true artist. 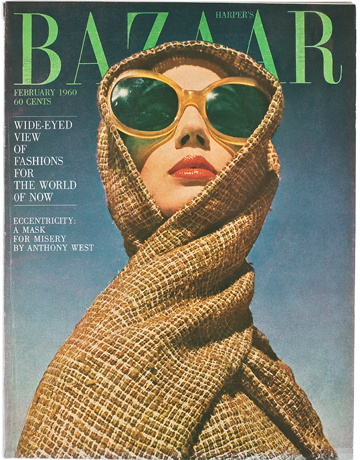 Her photo shoots weren’t advertising, but real art glorified in women’s magazines. She had a distinct eye for the fascinating and unusual, creating mind-blowing photo spreads of models abstractly posed in front of the Egyptian pyramids, walking the ruins in Rome and even standing with Sumo wrestlers in a snowy field in Japan. Lauren Bacall, Twiggy, Angelica Huston, and Cher, just to name a few, were her discoveries. She turned these virtual unknowns into famous models, and later even successful actresses. 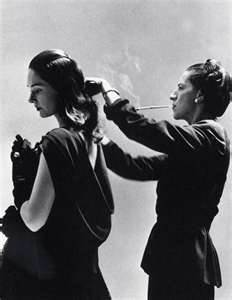 The brilliant photographers she worked with over the years all concluded that Vreeland was the real genius behind the scenes. Becoming a woman during the roaring 20’s and then living in Paris helped to shape her world view and prepared her for the role she was born to play. 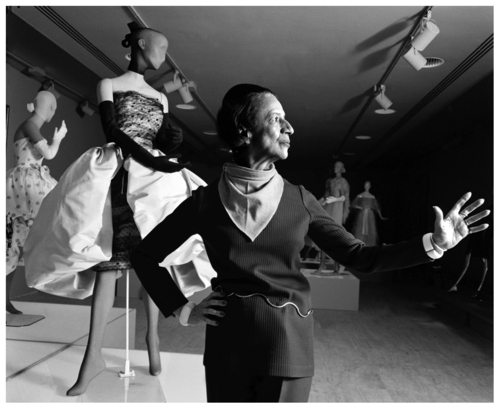 Vreeland redefined fashion and always seemed light years ahead of the trends. She became spiritually reawakened during the London rock explosion of the 1960’s and really put her stamp on the fashion world during the following decade. Like many powerful women, she was eventually fired from her position as Editor-in-Chief of Vogue, after nine years, because her male boss needed someone to blame for poor magazine sales. Nevermind the change in culture or the other myriad of reasons why Vogue was struggling. But one thing was for sure, Vreeland’s creativity never waned. Taking her firing hard, she became depressed and didn’t know what to do with herself. That was, until the Metropolitan Museum of Art in New York came calling. They asked her to work as a Special Consultant for the Costume Institute. Again, Vreeland started with nothing and made it into a circus. She transformed the Costume Institute into a place to go and be seen. She created 14 exhibitions during her tenure there and made fashion come to life. A year and a half ago, I visited the Alexander McQueen: Savage Beauty exhibit at The Met. After watching this film, I realized that this exhibit wouldn’t have had the over three hour line just to get in, and had become so crowded that I actually saw a girl pass out from heat stroke, if it weren’t for the dedication, brilliance, and sheer determination of Diana Vreeland in the years prior. We should all be so lucky to have such a zest for life and for the human image as she did. Middle of Nowhere is an aptly titled film. The most obvious meaning the prison where the protagonist Ruby, wonderfully acted by relative newcomer Emamyatzy Corinealdi, visits her husband Derek, played by Omari Hardwick. Derek is serving an eight year sentence for a non-violent crime. The correctional facility is located in Victorville, California, and any Angeleno will tell you that is in the middle of nowhere. But like any good film, the title has a deeper meaning. It is a metaphor for the state of Ruby’s life. A devoted wife and still very much in love with her spouse she voluntarily stalls the trajectory of her life, and waits for Derek. Four years into his prison sentence he is up for parole. Meanwhile, Ruby has made ends meet by forgoing med school and working night shifts as a nurse. She travels all night and makes multiple bus transfers to get home to her sister and help babysit her nephew. But it all comes crashing down on her, when she learns during the parole hearing that Derek may not have been as devoted to her as she was to him. It is at this pivotal moment, that the viewer becomes struck with the realization that Ruby is trapped and a lost soul. Unfortunately for Ruby, it takes her longer to come to this level of consciousness. That is, until she meets Los Angeles bus driver Brian, played by the Royal Shakespeare Company trained David Oyelowo. Like any good love interest, Brian has a wound too. He is recovering from a divorce and in similar fashion to Ruby he is screaming out for somebody to love him. There is a beautiful scene where after a date at a dance club, Ruby goes back to Brian’s place. But they just stand in the middle of the room and hold one another, as if they have never experienced human touch. Brian is persistent and he breaks down Ruby’s walls, freeing her of her past life with Derek and allowing her to finally go somewhere. The film written and directed by Ava DuVernay won the Best Director Award at the 2012 Sundance Film Festival. DuVernay started out as a Publicist in Hollywood and Middle of Nowhere is the second feature film she’s directed. I was lucky enough to stumble upon a surprise Q & A after the screening with actor Oyelowo. He shared that DuVernay first wrote this film ten years ago and the version on the silver screen now is the result of almost a decade of hard work. Any writer can appreciate that, because they know each project is a journey.